It’s Spring Break time, and that means its time to bust out the shorts, dresses, and sandals for some fun in the sun! Today was my boys last day of School before the break, so my husband and I are looking at some fun last minute trips. I’ve been shopping for swimsuits and sandals, and suddenly thought, “oh shoot, I need to get waxed!” I don’t know about you, but my legs always need a little extra help after a long winter. Going to the salon for a wax is always a little tricky with two kids, which is why these new Nads exfoliating body wax strips have been my saving grace.They smell like heaven, and work like magic. Plus, they save me the hassle and time I would have spent going to the salon, and not to mention the money I save as well! The perfect wax right at home, sounds good to me! Nads is the worlds first exfoliating wax strips that utilizes a 2-n-1 method to remove unwanted hair, and pesky ingrown hair from occurring. 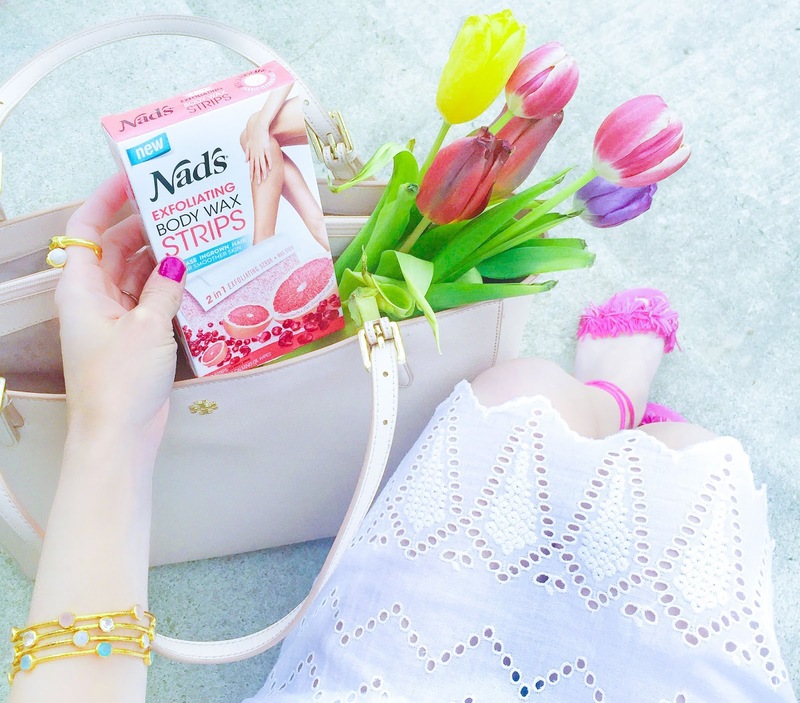 Make sure to stop by your local Target, to get yourself some Nad’s wax strips! You won’t be disappointed. Thank you Nads for gifting me these amazing wax strips, and for sponsoring todays post. As always, all opinions are my own. I have never heard or tried these but they sound awesome! I love those pink shoes! I am in love with your grey rug! Would you mind sharing the details? It makes such a gorgeous backdrop for your photos.